We are back in Penang. 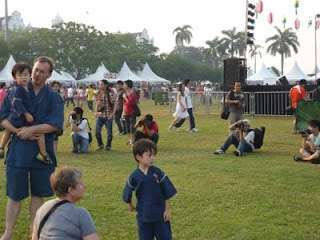 Today we went to Bon Odori festival organised by Penang Japanese society. The place was packed with Japanese and local people. In the last minute, I decided to wear a Japanese clothes. It was 25 years ago I last put it on so I didn't know how to put it on. I put it wrongly, my friend suggested at the venue, and I changed it quickly in the public toilet! Jason and Aratakara were taken photos by lots of local people. Among us, Allesia was most popular person. (The first photo is a part of the group of paparazzi.) 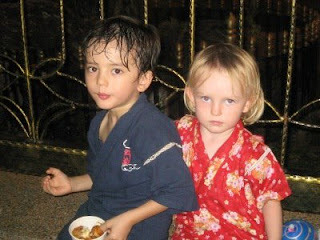 She is such a tiny blonde girl with Japanese clothes on. She was literally surrounded by locals who wanted to take her photos! Jason mum has just arrived with Jackie to visit us.